Grevillea wilkinsonii is a bushy shrub that may reach a height of two metres. The leaves are up to 17 centimetres long, 3 centimetres wide, dark green above and silvery-white below with toothed margins. The toothbrush-shaped flower-heads are an unusual purplish-pink. Flowering occurs in late spring to early summer. Blooms are both conspicuous and profuse. Grevillea wilkinsonii has proved to be very hardy in cultivation and will tolerate drought and frost. A light pruning, after flowering, will encourage new growth and abundant flowering. Grevillea wilkinsonii could be cultivated as a “stand alone” specimen and in native shrubberies. Grevillea wilkinsonii is a very rare species that occurs in two small, adjacent populations on the Southern Tablelands, in the Tumut area, of New South Wales. There are slight differences in the leaf shapes of the two populations. The total wild population numbers about 150 plants. Grevillea wilkinsonii faces a multitude of threats including browsing by stock, roadworks, herbicide spraying and flooding. Fortunately some protection has been provided by fencing. The species is classified as endangered with a very restricted distribution. Ripe seeds are collected by ants. Multiple seedlings have been observed growing out of ant nests. In our cold climate garden ants play a role in the dispersal of other Grevilleas and Acacias. In the plant description, published in Telopea, the journal of the Sydney Royal Botanic Gardens, a grader driver (name unknown) is mentioned in the acknowledgements. During roadworks he listened to pleas to avoid one of the Grevillea wilkinsonii populations. 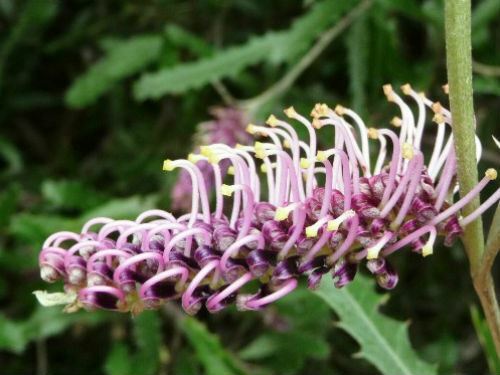 Grevillea wilkinsonii is becoming popular in cultivation so its future should be assured. The species is named after Tom Wilkinson who discovered the species and was named in 1993 by Bob Makinson. Propagation from cuttings is reasonably rapid.